Welcome to the start page for all games based on the cube engines. Free single and multi player 1st person shooter game with some satisfying fast oldskool gameplay. A large variety of gameplay modes from classic SP to fast 1 on 1 MP and objective based teamplay, with a great variety of original maps to play on. Go download it on the Sauerbraten homepage. Red Eclipse is an impressive total conversion of Cube 2 / Sauerbraten focussing on agile movement physics and multiplayer gameplay. Go to the Red Eclipse homepage. Cube is the original game that started it all. 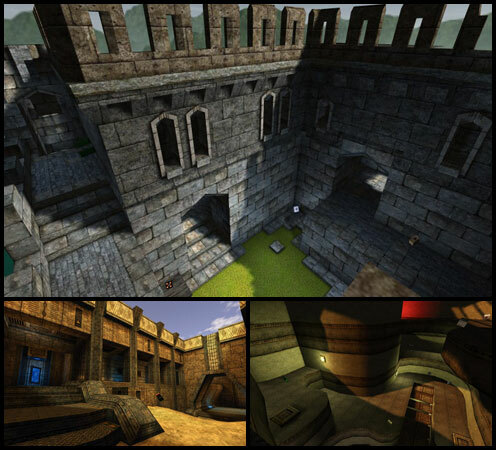 Though it has been surpassed in almost every way by Cube 2, it is a game in its own right. Most importantly, it comes with over 100 (!) 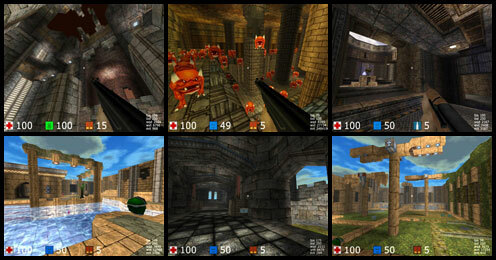 maps, most of which are not available in Cube 2, with extensive single and multi player content. Cube is also smaller in every way, in download, in hardware requirements (runs well on older video cards! ), and in source code (the absolutely tiny code base is a very easy start for those wishing to experiment). It also has some unique engine features such as the high precision dynamic occlusion culling, and its heighfield based level format. Go to the Cube homepage. AssaultCube is probably the best Cube "mod" ever created. It comes with all new content and is playable as a standalone game. The gameplay provides a more "realistic" gameplay experience than Cube, featuring more modern weaponry and environments. Many gameplay modes are provided including CTF. Go to the AssaultCube homepage.